I tried to lose weight through Tae Bo workouts. I had a copy of Billy Blanks tape and I play it almost every morning for less than a month. I lack the right exercise clothing or the colorful wrist braces worn by Billy Blanks, but it doesn’t bother me. I intently follow every step even if it means exerting more effort to get the proper footwork. I don’t own a weighing scale so I don’t have a way to measure how much I lose during those intense weeks of exercise. But somehow I feel lighter and feel good about myself. 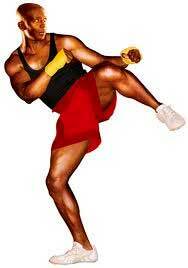 This entry was posted in Exercise and tagged taebo, taebo exercise on June 10, 2011 by Yami.